(Photo courtesy Brian Brown) | Snow dusts Snowbird Ski & Summer Resort on Oct. 5, 2018, when the resort recorded its first measurable snowfall of the ski season. Despite lackluster snowfall last year, Utah’s ski resorts say they’re ready again this year for whatever nature throws — or doesn’t throw — at them. Last year, Utah’s slopes saw 4,145,321 visitors, a 9.6 percent drop from 2016-17’s all-time record of 4,584,658 visitors but still in line with the state’s 10-year average. Snowfall, on the other hand, was just 60 percent of normal. “That speaks to the resorts that, without the help from Mother Nature, were still able to provide a great experience on and off the slopes,” she said. Furin said besides their proven ability to make whatever snow the weather doesn’t provide, resorts are optimistic because of reports of a possible El Niño system that could bring more natural snow to the state’s slopes. According to the National Weather Service, this coming winter has a 70 percent to 75 percent chance of having an El Niño event. The probability of an El Niño event happening is far more certain, however, than what its effects on the state would be. Lacking enough data from past El Niño events to give a definitive probability of whether that would mean more or less precipitation, or higher or lower temperatures, the weather service has made some guesses. The eastern and southern regions of the state have a one-third probability of seeing above-normal precipitation this winter, while the northern and western parts have about even odds for having below-average, average and above-average precipitation. That being said, historical data do indicate that the Wasatch Front often sees somewhat higher precipitation during El Niño events. The winter as a whole has a 45 percent chance of above-normal temperatures. Whatever the weather brings, some resorts are already hedging their bets. At Park City Mountain, workers are looking to start snowmaking as soon as temperatures drop in anticipation of their Nov. 21 open date, said Jessica Miller, senior communications specialist with Park City Mountain. Utah wasn’t the only state with lower-than-average snowfall last year. Vail Resorts, which owns both Park City Mountain and Canyons in addition to more than a dozen other resorts around the world, knows the value of having a dependable source of snow, said Miller. Having snowmaking capabilities has transformed from a shortcutting luxury to a standard in ski resorts, stabilizing business against a capricious source of the real stuff. The machines were vital for 2017’s dry opening at Brian Head Resort, said Trace Whitelaw, who does marketing, public relations and digital media for Brian Head. While early indications of what winter 2018 will bring are encouraging — the resort has already seen about 20 inches mountainwide — Whitelaw said the snowmaking machines are at the ready, just in case. 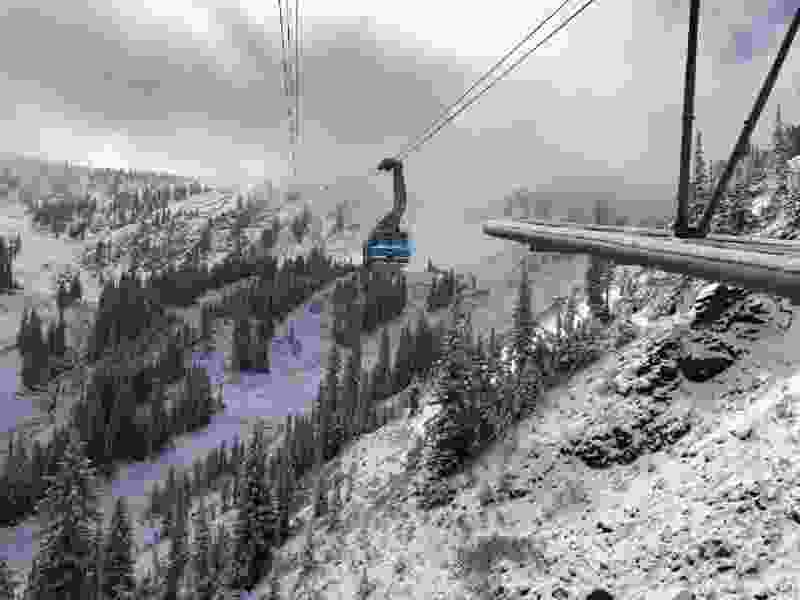 Alta Ski Area: Alta has added a fixed grip quad chairlift to connect the ski area to the newly expanded Snowpine Lodge. Opens Nov. 23; lift tickets are $88 for adults, $46 for children under 12, and free for skiers age 80 and up. Beaver Mountain: Open date TBD; lift tickets are $50. Brian Head Resort: Open date Nov. 16; all-day lift tickets are $42 for adults and $30 for kids and seniors on weekdays, and $59 for adults and $43 for kids and seniors on weekends. Brighton Resort: Brighton has joined the Ikon Pass season, allowing passholders seven days of skiing or riding at the resort. All of the resort’s terrain is accessible by high-speed quads, and it has the most night skiing in Utah with 22 runs over more than 200 lighted areas. Open date TBD; lift tickets are $85 for adults 14 to 64, $57 for seniors 65 and older, and $53 for kids 11 to 13. Kids 10 and younger ski free. Deer Valley Resort: Deer Valley has been undergoing an $8.1 million capital investment this year, with improvements including replacing the Homestake chairlift with a new, detachable, high-speed quad chairlift. The resort has also improved its snowmaking capabilities and made general updates throughout its facilities. Opens Dec. 8; tickets are $169 for adults, $118 for seniors 65 and older, $105 for kids 5 to 12, and $40 for tots ages 1 to 4. Eagle Point Resort: Eagle Point Resort has added its first-ever snowmaking system. The resort is also adding high-speed internet throughout its lodges and wi-fi hotspots. Opens Dec. 21; tickets are $60 for adults and $45 for youth and seniors on weekends, $45 for adults and $35 for youth and seniors on Fridays, and $35 for adults and $25 for youth and seniors on Mondays. Holiday lift tickets are $70 for adults and $50 for youth and seniors. Nordic Valley: Open date TBD; tickets are $30 for adults and $22 for kids on weekday nights, and $50 for adults and $35 for kids full-day on weekends. Park City Mountain: The new High Meadow Park at Canyons Village makes its debut this year. In addition, the old High Meadow four-passenger lift has been replaced with a high-speed, four-passenger lift. Park City is also adding new snowmaking to High Meadow. Opens Nov. 21; tickets are $95 for adults, $66 for seniors and $61 for kids. Powder Mountain: Open date TBD; tickets are $88 for adults, $49 for kids, $66 for seniors and $58 for members of the military. Snowbasin Resort: Earl’s Lodge has increased seating capacity in the Cinnabar by 50 percent, with plans to expand seating in the Huntington Room and Main Dining Room. In addition, the Mt. Ogden Bowl Road has been graded and widened. Opens Nov. 21; tickets are $115 for adults 13 to 64, $65 for kids 7 to 12, $89 for seniors 65 to 74, $45 for seniors 75 and older. Kids 6 and younger ski free. Snowbird: Snowbird has installed two pedestrian bridges to allow easier access to The Cliff Lodge, Snowbird Center and Lower Village. In addition, the Snowbird Center has a new 1,700-square-foot guest lounge on level 2. Opens Nov. 30; tickets are $125 for adults over 13, $60 for kids 7 to 12 and $105 for seniors 65 and older on off-peak days. Peak days are $135 for adults, $65 for kids and $115 for seniors on peak days. Kids 6 and younger ski free. Solitude Mountain Resort: Solitude also has joined the Ikon Pass. Opens Dec. 1; day lift ticket prices are TBD. Sundance Mountain Resort: This winter marks Sundance’s 50th anniversary. Opens Dec. 7; tickets are $85 for adults, $58 for kids 6 to 12, $30 for seniors 65 and older and $60 for members of the military. Holiday lift tickets are an additional $10.